The Infinity Link—soon to be a major motion ebook! 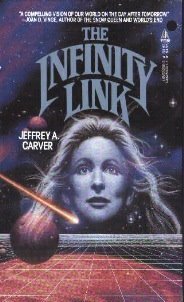 I wrote recently that I was proofreading the computer file of my 1984 novel, The Infinity Link, for a pending ebook edition. I still am. (It’s a long book, and proofreading is a slow job.) That’s not news. What is news is how much I’m liking the book. I mean—really liking it! It’s a good book! Okay, that probably sounds dumb, because on the one hand you’re not supposed to think your own book is bad, but on the other hand, it sounds braggy if you say your own book is good. But…I haven’t read through this novel in years, many years, and I was fully expecting to find it—you know, good, but not that good, and full of passages that I wished I’d done a little differently, or kept shorter, or something. But the truth is, I’m not really thinking of it as my book as I’m reading it, and I’m just really enjoying it. I expect any of you who are writers or artists know exactly what I’m talking about, and the rest of you are nodding tolerantly, thinking, there there, have a nice cup of tea, you’ll feel better. The Infinity Link is out of print, but you can still get new copies from me, or used copies online wherever online used book dealers gather. And soon, you’ll be able to buy it as a brand new ebook! So Many Titles, So Little Time! i got a sunborn for christmas from the wifey. haven’t started reading it yet though, trying to finish something else up. looking forward to it! Hi Mr.Carver,Im posting this comment from the tiny island nation of Fiji… anyway i’ve read your novel recently and the way you constructed the plot and the development of the characters (esp Mozy) was outstanding. I love how you kept shifting Mozy’s mind from human body, to machine, and finally to the Talenki mind net. LOVE YOUR WORK. P.S Would have loved to explore some of the alien worlds, esp the ones where the plants were mentoring a civilization. Forget the numbers. This reflects the overall editing process. Both volumes are going through a final pass, prior to publication.